These days, I imagine there are few people who can really get around Iraq’s archaeological sites without difficulty, and even fewer who have the know-how to take the kinds of pictures that are high in quality and resolution, are useful and educational, and don’t feature themselves in foreground with their thumbs up like they’re standing in front of Cinderella’s castle at Disney World. 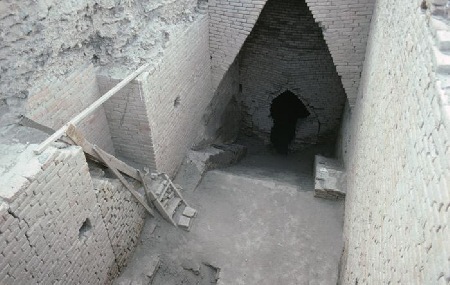 In short, there is a shortage of current pictures that show on-site archaeology in Iraq and the effects of the current events on those archaeological sites. That is why when I came across this page of a photo album by an American who served in Iraq I felt I had to peruse the wealth of high-quality pictures that include archaeological sites, as well as the modern side of Iraq in recent years. Although the descriptions are very informal, the pictures are priceless. Love has been celebrated in song, dance and literature since humans set foot on Earth, but because nothing was put in writing for a while, the world’s oldest love poem only dates back to 2025 BC. The poem is the celebration of a ritual that took place each Mesopotamian new year, an event that took place around the Spring Equinox. It was written on the tablet found for King Shu-sin (2037-2029 BC), the fourth ruler of the Third Dynasty of Ur. The 29 lines are written in Sumerian and celebrate the sacred marriage between the Sumerian king and the Sumerian goddess of love and war, Inanna. You can find a more detailed explanation of the ritual here, and an English translation of the poem here. The tablet on which the poem is written is housed at the Istanbul Archaeological Museum in Turkey. *This post has been updated to reflect the latest information and links available online dealing with the subject. What do you know about Ur? What do you know about the ancient city of Ur? Maybe you know that it is where the best-preserved zigurrat, which is one of the most famous historical monuments in the world, stands. Maybe you know that it is mentioned in the Bible several times as Ur of Chaldee. Maybe you know that it is the birthplace of Abraham. There is a lot more, less common knowledge about the city that was once a capital of a great Mesopotamian civilization–the ancient civilization of Sumeria. Actually, Ur is a word that means City in both the Sumerian and Akkadian languages. Ur’s prominence was between the 4th and 1st half of the 3rd millenium BC, during which it was ruled by three dynasties. It was also the hub of worship of the moon god, Nanna, for which the zigurrat was dedicated. Today, Ur is an archaeological site marked by the same 70-foot zigurrat and Royal Tombs. The Royal Tombs are comparable only to the Egyptian tomb of Tutankhamen in their wealth of a most comprehensive collection of artifacts that paint one of the clearest pictures of an ancient civilization ever unearthed. You can view pictures of jewelry, weapons, statuettes and other artifacts unearthed from the Royal Tombs at Ur here, with some great commentary and explanations from that website’s incredibly knowledgeable source. If you live near, or are going to be in the area of the University of Pennsylvania Museum of Archaeology and Anthropology, you can see a number of these artifacts in person. Information available here. It’s hard to imagine that the above structure once stood on the banks of a flowing, almost gushing, river, but that very detail was what made Ur flourish. Though the river has long changed its course, Ur’s location along the Euphrates River in antiquity gave it access to the sea, bringing the city endless wealth. 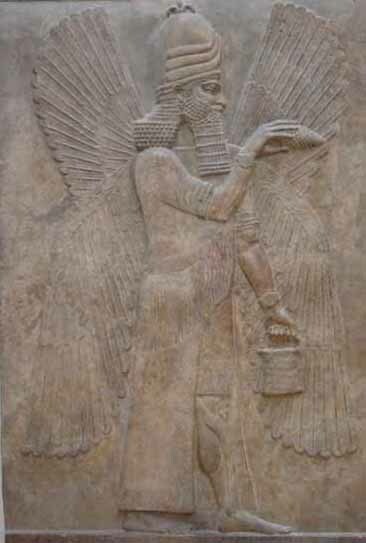 A renaissance of Sumerian art and literature took place during the third dynasty, under the reign of Ur-Nammu, who is credited with writing the first law in history. More details about the three dynasties and other information about Ur can be found here. Below is a list of all the links I used to put this piece together. I hope you will visit them all, as they contain some great pictures and incredibly fascinating information I did not include in this piece. When I took my first ancient history class in high school here in the States, I was very disappointed to find that there was very little covered of Mesopotamia, if anything at all. The same thing happened when I took Western Civilization in college. In fact, to this day, I know more about Ancient Egypt, Greece and Rome than I do about Mesopotamia, and that is sad, but that is the reality of what parts of history the general masses are most exposed to, or even to which they are drawn. Well, although what I’m about to show you is more of a bible study aid, it can be used as a tool to make Mesopotamian history as fun as ancient Egyptian or Greek or Roman history to anyone, especially those who are very visual and artistic, and if you’re homeschooling your child, you have a chance to give them a one-up on other kids by exploring Mesopotamian history. You can also just make your own art to pay homage to the cradle of civilization! I think the funnest part of history and archaeology is that even a silly joke told by a people and culture long gone can reveal the character of those people and humanize them, making us understand them better as human beings and cease to look at them as just textbook subjects. In the case of the world’s oldest joke, which, surprise surprise, happens to be Sumerian, the similarities between what topics made ancient Mesopotamians laugh and what topics make us laugh today is uncanny. Now, it’s not funny to me, and I doubt it’s funny to you in its form, but if you break it down to topics, it is something not too foreign as a topic of humor. To this day you hear men telling jokes that include passing wind, and the “old ball and chain” jokes run rampant in every male gathering the world over. Now I have to wonder if Mesopotamian women laughed at the world’s oldest joke. We all know about hieroglyphics and Egyptology, but very few of us know about even the existence of Assyriology, or the fact that there are more written documents from Mesopotamia than from all of antiquity combined. We really need those who are passionate about the cradle of civilization; the birthplace of writing, the wheel and earthly law. We need that passion to bring Mesopotamia to the same level of popularity and common knowledge as Ancient Egypt. Well, there are such people, tucked away in places where few people feel comfortable treading, but should. I read a very interesting Q&A with such a person, an Assyriologist and expert on the long-extinct Akkadian language. Yale Daily News published an interview this month with Benjamin Foster, Laffan Professor of Assyriology and Babylonian Literature, as well as the curator of the Yale Babylonian Collection. According to Foster, Yale’s collection is the largest Babylonian collection in the entire United States. He points out that the collection compares worldwide with those kept by the British Museum, the Louvre and even those in Baghdad! In the interview, Foster says that despite the collection having 45,000 tablets with Akkadian writings that range in subject from law materials to the earliest women’s writings, many “Yalies” even are unaware that their school holds such a treasure trove of the world’s history. The interview ends on a lovely note with Foster’s passionate explanation of his favorite Akkadian word and its definition. You can find the full Q&A here. With the holiday season coming up and those bags of cinnamon-scented pine cones hitting store shelves soon, I think it would make a great topic of conversation at your next holiday party to explore the significance of pine cones in Mesopotamian mythology and art. Pine cones are symbolic in that they are where the life cycle of a pine tree begins, and conversely, where new life begins. Pine cones are representative of continuing life, and Tammuz represents regeneration. The pine cone is used by the genii to sprinkle water on passersby, to bless them.